Calcium/Calmodulin-dependent protein kinase II (CaMKII) plays a key role in the molecular mechanism of memory formation. CaMKII is known to be activated specifically in the activated spines during memory formation. However, it is unclear whether the specific activation of CaMKII is necessary for encoding information. Here, we overexpressed active form of CaMKII (CaMKII*) in the hippocampal CA1 region to activate CaMKII nonspecifically. Moreover, we examined context-discrimination performance of mice. We found that the mice with overexpression of CaMKII* showed impaired context-discrimination ability, while the contextual fear conditioning remained intact. These results indicate that spatial specificity of CaMKII activation is necessary for context discrimination. The online version of this article ( https://doi.org/10.1186/s13041-019-0454-3) contains supplementary material, which is available to authorized users. 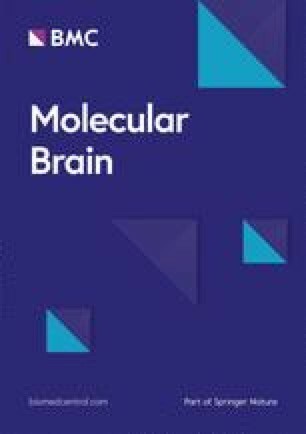 The molecular mechanism of learning and memory has been the subject of numerous neuroscience studies, since decades. Previous studies have revealed that Calcium/Calmodulin-dependent protein kinase II (CaMKII) is activated during memory formation, and initiates biochemical cascades in response to various stimuli in the dendritic spines [1, 2, 3]. In addition, it has been reported that CaMKII is specifically activated in the dendritic spines, which in turn are activated by stimuli, to induce the spine maturation [4, 5]. However, there is no evidence about whether the non-specific CaMKII activation perturbs memory formation. Previous studies have shown that overexpression of activated CaMKII (containing T286D, T305A, T306A; CaMKII*) increases spine volume and perturbs memory trace during the maintenance phase [6, 7]. Therefore, selective activation of CaMKII in specific spines might be necessary for intact memory formation. To test this, we overexpressed activated CaMKII in the hippocampal CA1 region, which is necessary for memory formation . We expressed the active form of CaMKII (CaMKII*) or mCherry under the CaMKII-alpha promoter in the human embryonic kidney (HEK) 293 T cells, which was delivered by adeno-associated virus (AAV) . We confirmed successful overexpression in the HEK 293 T cells (Additional file 1: Figure S1a). To evaluate the expression in the CA1 hippocampus, we used human influenza hemagglutinin (HA) tag, and confirmed HA expression in the hippocampal CA1 region slice after performing a behavioral test (Additional file 1: Figure S1a and b). After the injection of viruses in the hippocampal CA1 region, we examined the effect of CaMKII* overexpression via evaluation of context discrimination, which is a hippocampus-dependent form of associative learning [10, 11]. To quantify the context-discrimination ability, mice were trained to discriminate between two contexts, namely shock and neutral contexts. In the shock-context chamber, mice received a shock; while in the neutral-context chamber, they just explored. We examined the percentage of the time spent freezing (freezing level) after 1 day of conditioning in each context (Fig. 1a). We found that both the groups of mice showed a similar freezing level in the shock context. This indicates that CaMKII* overexpression did not affect the contextual fear conditioning (Fig. 1b). However, in the neutral context, the mice with CaMKII* overexpression showed an increased freezing level (Fig. 1c). This implies that the ability of mice to discriminate different contexts is decreased by CaMKII* overexpression. In addition, CaMKII* group showed significantly higher discriminative ratio (Fig. 1d) . Moreover, we examined the freezing level in shock-context chamber after 3 weeks of the conditioning to assess remote memory. The mice showed similar freezing levels both after 1 day and 3 weeks of conditioning, and there was no difference between the two groups (Additional file 1: Figure S2). These results show that CaMKII* overexpression does not impair the ability of mice to maintain contextual memory. 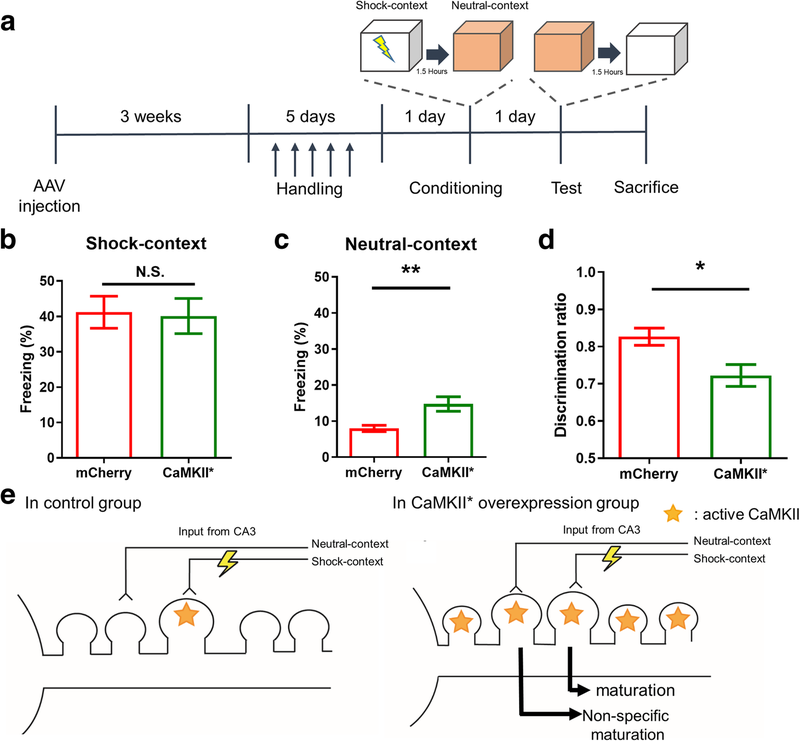 The present study demonstrates that CaMKII* overexpression in the hippocampal CA1 region can impair the ability of context discrimination; however, the contextual fear conditioning remains intact. One possible explanation for this may include specificity of spine maturation. In a normal state, CaMKII activation may only strengthen the synapses between engram cells during memory formation (Fig. 1e) . However, when CaMKII* is overexpressed, it may not only activate specific synapses, but also other synapses (Fig. 1e). A previous study has shown that CaMKII* overexpression can produce synaptic potentiation and increase spine volume, which supports this explanation . In addition, a previous study has shown that hippocampal lesion may impair the ability of context discrimination, but not fear conditioning . Thus, it might be possible that the impairment of context-discrimination ability in this study was due to malfunction of the hippocampus. Loss of context-discrimination ability is also related to post-traumatic stress disorder (PTSD) . Impairment of context discrimination in the mice with CaMKII* overexpression implies that excessive CaMKII activation may be responsible for this disorder. Therefore, further studies are required to reveal the relationship between CaMKII activity, spine specificity, and memory discrimination. This may help to better understand the disorder to find its cure. This work was supported by the National Honor Scientist Program of Korea (to B.K.K., NRF-2012R1A3A1050385). BKK, SY conceived and designed the experiments. SY produced viruses, performed viral injection and fluorescence imaging. JIK conducted behavioral experiments. JK participated in western blot experiments. SY and BKK prepared the manuscript. All authors read and approved the final manuscript. All the surgeries and experiments were reviewed and approved by the Institutional Animal Care and Use Committee (IACUC) at Seoul National University. Consent to participate is not applicable.